Trentino is an autonomous wine-producing province in the far north of Italy, bordering Lombardy to the west and Veneto to the south and east. 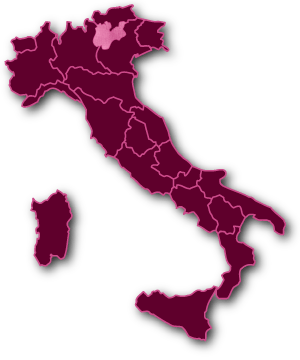 The province forms the southern half of the Trentino-Alto Adige region, the other half being Alto Adige (Sudtirol to its largely German-speaking population). Trentino’s terroir is very similar to that of Alto Adige, although 500ft lower down the valley and slightly less dominated by the mountains above. Nonetheless, it remains characterized by the alpine peaks which soar for many thousands of feet above the Adige Valley floor. The peaks and ridges bring protection from the elements, casting a rain shadow over the valley and channeling warm air currents through it as the land heats up and cools down over the course of the day. This reliable mountain breeze keeps vineyards free from undesirable rot and fungal diseases. The region follows the Adige river along its north-south course down from the Alps towards the plains, winding past various valleys and lakes. The DOC structure in Trentino consists of one large regional DOC (entitled Trentino, and granted in 1971), and several smaller DOCs which focus on specific areas and styles. 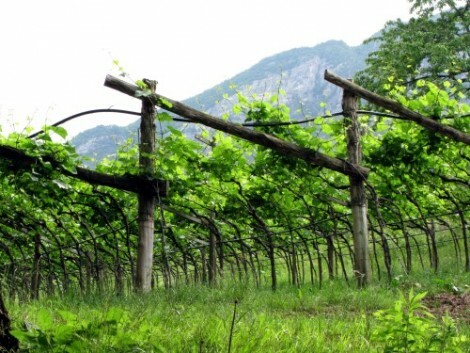 The Teroldego Rotaliano is perhaps Trentino’s most famous red wine along with other native red varietals such as Schiava and Lagrein, the white Nosiola, Pinot Grigio and several international varieties, of which Chardonnay and Pinot Noir are the most widely used. Trentino wines have found their niche, both in Italy and abroad, among wine drinkers who look for reasonably good and affordable wines for daily enjoyment.